This sword pays homage to the One-Eyed Dragon of Oshu, Date Masamune. Known for his audacious crescent moon kabuto and black and gold armor, Masamune's legacy is one of conquest by blood and steel, contrasting with his reputation of being forward thinking, cultured, diplomatic and sympathetic to foreign causes and Christianity. This new katana by Paul Chen / Hanwei features a blade forged from differentially tempered 65Mn steel with an edge hardness of 60 hrc and a back of 40 Hrc. One side of the tsuba shows him holding a war fan, while the blade side features his soldiers armed with firearms. The kashira is embossed with a blackened one-eyed dragon, contrasting the gold embossed falcon on the kashira. The tsuka is wrapped in brown suede around white same (ray skin) for an incredibly sure grip. 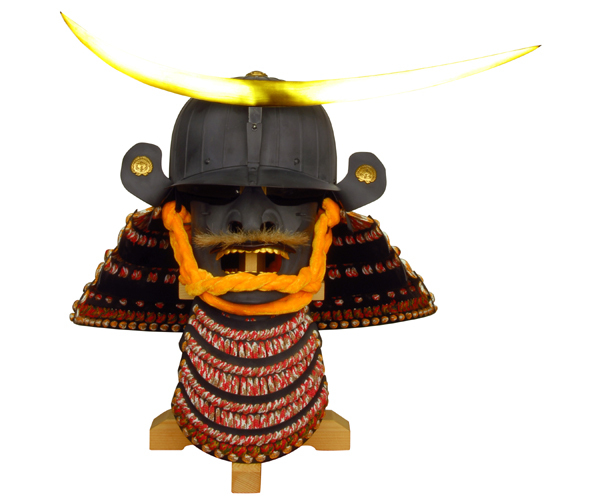 The meticulously detailed gold menuki shows Masamune's kabuto on one side and his breastplate and shoulder armor on the other. The 27 1/4" forged steel blades possesses a prominent and deep hamon and is well balanced for cutting. The black textured saya is contrasted with a brown cotton sageo wrap and buffalo horn kurikata and kojiri.